Thai cuisine has its origins in Chinese cooking (wok) and Indian cuisine (curries). The dishes are also influenced by many centuries of trade relations. 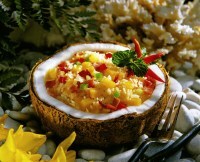 However, Thai cuisine has its very own character and may be one of the most tasty of the world. Often fresh herbs such as coriander, lemongrass, basil and chilli peppers are used. The dishes have a variety of tastes: sweet, sour, hot, spicy or bitter. Thus, a spicy appetizer, followed by a milder main course, accompanied by a sour soup. Soup is often served as a side dish in Thailand, eaten during the main meal. For the main course is usually white rice is served. Thai rice is known for good quality as Pandan rice and Jasmine rice. Noodles and fried rice is also eaten, but as a lunch dish. Contrary to popular belief, people eat in Thailand not with chopsticks, but with spoon and fork. Only noodles are eaten with chopsticks. Cooking a Thai dish requires a lot of preparation. The dish is then usually very quickly stir fried in a wok over high heat. This retains all the flavors and vitamins. Instead of salt, fish sauce Nam Pla is used. 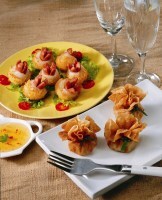 Some dishes can be very spicy, especially for the western taste. These dishes are marked as spicy in our menu. For lovers of a delicious dessert, Thai cuisine offers plenty of choice. Also here you can see again the variety of flavors and dishes that can be served hot or cold. Sweet or sour fruit is often eaten with salt. Many desserts are prepared with fresh fruit and coconut milk.